Bestselling sportswriter Peter Golenbock knew Mickey Mantle, Billy Martin, Jim Bouton, Joe Pepitone, and many of Mantle's friends, family, and teammates. While Mickey was a good person at heart, he had a dark side that went far beyond his well-known alcoholism and infidelities. In this fictional portrait, Mickey--now in heaven--realizes that he's carrying a huge weight on his shoulders, as he did … throughout his life. He needs to unburden himself of all the horrible things he did and understand for himself why he did them. He wants to make amends to the people he hurt, especially those dear to him; the fans he ignored and alienated; and the public who made him into a hero. Mickey never felt he deserved the adulation, could never live up to it, and tried his damnedest to prove it to everyone. The fact that he was human made the public love him that much more. Through the recounting of his exploits on and off the field, some of them side-splittingly hilarious, some disturbing, and others that will make your head shake in sympathy, Mickey comes clean in this novel in the way he never could in real life. 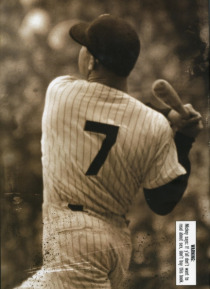 7: The Mickey Mantle Novel puts you inside the locker room and bedroom with an American Icon every bit as flawed and human as we are.